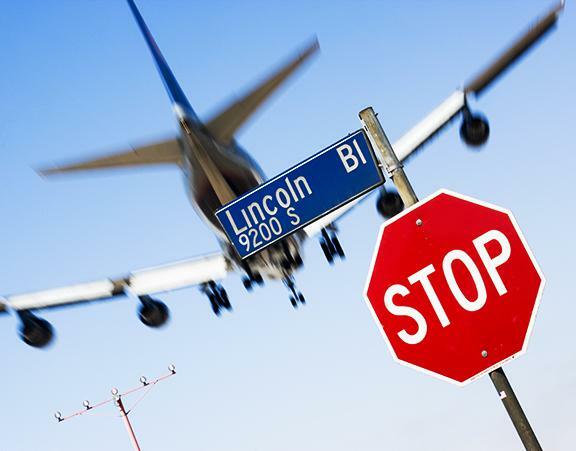 This photo was made on Lincoln Blvd at the end of one of the landing runways at Los Angeles International airport. It is part of my small one month project to make photos of passenger jet landing at that airport. I was directly beneath the jets as they passed overhead and close enough to feel the jet wash. The jets cross over Lincoln Blvd at an altitude of less than 100 feet. I used the small aperture to get a slow shutter and blur the jet to give the impression of movement. Canon 5D Mk III using Canon 100m lens, ISO 100, f/29, 1/20 second.